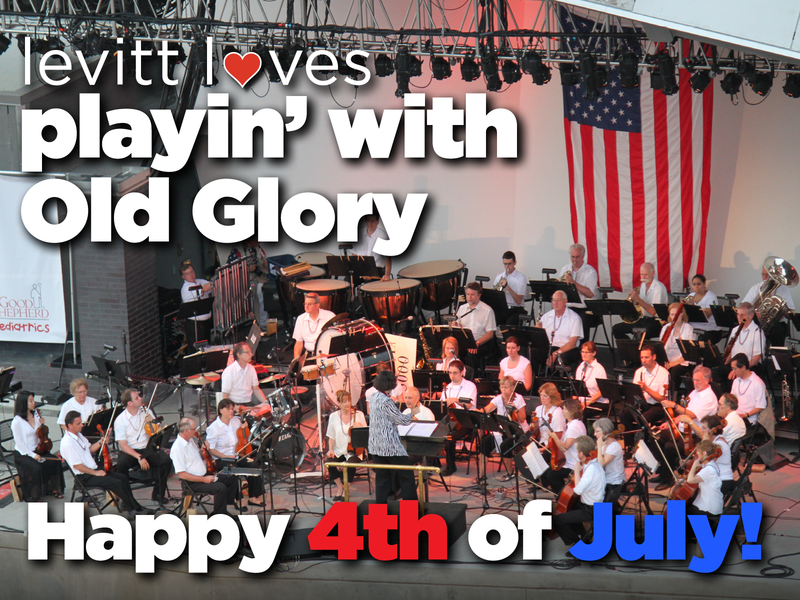 Levitt loves…playin’ with Old Glory! With barbecues and fireworks happening all across the country, Independence Day just isn’t complete without festive music and the American flag! Check out this photo from Levitt Pavilion SteelStacks’ opening weekend in 2011, with Old Glory displayed for the 4th of July holiday. Local group Allentown Symphony Orchestra performed an exciting night of patriotic music, followed by fireworks lighting up the Bethlehem sky. Levitt concert series continue to delight audiences’ eyes and ears this Independence Day. Tonight, Levitt AMP Utica kicks off its concert series with Los Angeles jazz-funk fusion band Groove Legacy while Doug Wimbish of GRAMMY-winning Living Colour rocks Levitt AMP Asbury Park as Wim-bash. Wishing you a fun and memorable night of Independence Day festivities! This entry was posted in Holidays, Levitt Loves and tagged Independence Day on July 4, 2016 by Lucy Truong.